Vials hold some of the nanocrystals that Jain can manipulate with voltage to change their light-related properties. Quantum dots are crystal particles, with a diameter of tens to thousands of atoms, that can absorb and emit different wavelengths of light or move electric charges around. Now Prashant Jain, a chemistry professor at the University of Illinois, has figured out a way to create tunable quantum dots that can be adjusted on the fly. His innovation could be key to designing optical computers and ultra-efficient solar panels. 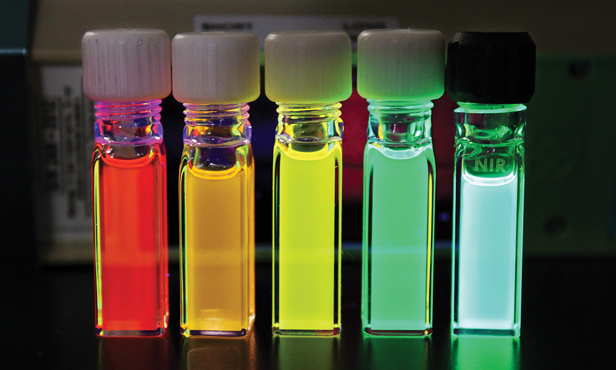 Jain makes quantum dots out of copper sulfide, varying the ratio of copper atoms to sulfur atoms. At certain ratios, the amount and distribution of electrical charges inside the dots becomes sensitive to small changes in voltage—and it’s that charge distribution that mostly determines the dots’ properties, such as which wavelengths of light they’ll absorb and emit. “You can controllably push and pull charges into these semiconductor nanocrystals and thus turn on and off their ability to interact with light,” he explains. That means the dots could function as submicroscopic optical switches—potentially, core components of an ultrafast optical computer that replaces electricity with beams of light. Jain’s tunable-quantum-dot switch is about one-sixth the size of today’s smallest transistors, and about a hundredth the size of current optical switches. Jain is also making quantum dots out of titanium oxide mixed with bismuth. These dots absorb solar light and convert it to electrochemical energy, which is used to generate hydrogen fuel from water. Jain’s dots are still very much in the research stage, and he predicts it will take an enormous amount of additional research to achieve practical optical computers or the super-efficient hydrogen production needed for energy applications. “There’s a lot more fundamental work to be done,” he says.